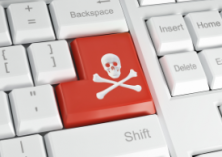 Last year several major record labels, helped by the RIAA, filed a lawsuit against ISP Grande Communications, accusing it of turning a blind eye to pirating subscribers. The ISP refuted these claims and in August it submitted a motion for summary judgment in its favor. Grande argued that the labels are trying to expand copyright liability for Internet services, largely based on flawed evidence. “Having given up on actually pursuing direct infringers due to bad publicity, and having decided not to target the software and websites that make online file-sharing possible, the recording industry has shifted its focus to fashioning new forms of copyright liability that would require ISPs to act as the copyright police,” Grande wrote. The strongly worded motion triggered a response from the labels this week. Their reply doesn’t respond directly to the ‘copyright cop’ comments, but the record labels argue that Grande was more than a passive bystander. The labels oppose many of Grande’s claims and also submit a motion for summary judgment themselves, relying on testimony from various experts, as well as the ISP’s own documents and witnesses. “The record evidence and relevant law conclusively establish Plaintiffs’ entitlement to summary judgment that Grande is liable for contributory copyright infringement,” the labels write, stressing that the ISP knowingly facilitated and greatly profited from pirating subscribers. In its motion, Grande raised serious doubts over the accuracy of the Rightcorp infringement notices being used as evidence. However, the labels counter that this isn’t reflected in the company’s actions. Before the lawsuit was filed, Grande forwarded Rightcorp notices to its customers, they argue, and more recently the company terminated several accounts. These “repeat infringer” terminations relied in part on Rightscorp notices. It’s worth noting that these terminations only happened after the lawsuit started. Perhaps triggered by the legal trouble, Grande changed its policy which meant that subscribers could lose their Internet access following Rightscorp notifications. “Grande’s general manager admitted that subscribers who had engaged in similar conduct in the past would have been terminated had Grande’s current policy been in place prior to 2017,” the labels argue. Without spelling it out, the labels use Grande’s new termination policy against the company. How can Rightscorp’s notices be inaccurate and flawed, if they are good enough to terminate subscribers now? And why change the earlier policy? 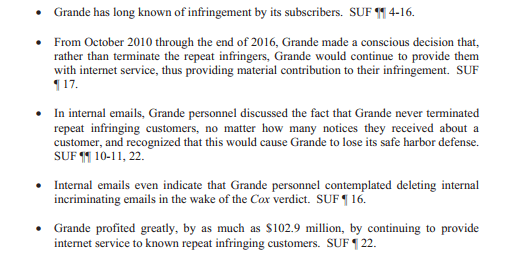 Rightscorp’s notices aside, the record companies argue that Grande was well aware of the large number of pirating subscribers on its network. In addition, there is abundant evidence that Grande acted intentionally, or at the very least recklessly, they argue. For example, Grande’s employees internally discussed that repeat infringers would not be terminated, no matter how many notices were received against them. Also, following the Cox verdict in (a similar case), a senior manager at the ISP repeatedly suggested that the company should delete emails to avoid having the sort of incriminating evidence which made Cox liable for pirating subscribers. It’s clear that Grande and the record labels differ in their view on whether the ISP is liable or not. Is the lawsuit a push to expand liability and turn ISPs into copyright cops based on shoddy evidence? Or was Grande willingly ignoring all copyright infringement notices so it could continue to profit from pirating subscribers? These questions are now up to the court to answer after which the case will likely proceed to trial, currently scheduled for early next year. The labels’ opposition to Grande’s motion for summary judgment is available here (pdf). The same document also includes a cross-motion for summary judgment from the record companies. Grande asked the court to strike this from the record (pdf) as it constitutes a second motion for summary judgment.